Cold sores, also known as fever blisters, are painful and also embarrassing. Some people struggle with them more than others and because they are a contagious oral virus, you can pass them back and forth between people you are close to. The virus that causes cold sores is known as herpes simplex virus (HSV). There are two types of HSV, type l, and type ll. Cold sores are generally caused by type l. The virus can be spread by kissing or other close contact with the sores or even from contact with skin that seems normal but is shedding the virus and infected saliva without the presence of sores. The virus is most contagious when open sores are seen and the risk is less once the blisters have dried and crusted over. You may have heard that you can catch the herpes virus from touching contaminated surfaces, washcloths or towels, know this is a myth. Fever blisters go through several stages. At first, you might have tingling of your skin, followed by itching and burning around your lips. This is the first sign that a fever blister is developing (the best time to begin treatment). The blister will form on the border of the lips within 24-48 hours. It will eventually break and ooze and then dry out and crust over. A scab will form and protect the new skin underneath. When the sores disappear, the virus enters the dormant stage where it travels up the nerve where it stays latent. When it becomes active again it travels back down the nerve to the skin and causes blisters called cold sores. Although not usually serious, a cold sore infection can be life-threatening for those with a compromised immune system. Some people develop antibodies and don’t get another infection again. However, 40% of adults get repeated cold sores. Numerous studies have shown the effectiveness of essential oils to remedy cold sores. Essential oils may have an advantage over antiviral drugs that can have side effects. Keep in mind that you should not take essential oils orally. When used for the remedy of cold sores, most essential oils are applied topically to the skin after being mixed with a carrier oil such as coconut oil or sweet almond oil. 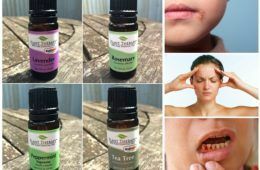 Here are ten essential oils that show promise in the treatment of the virus and ease of symptoms associated with cold sores. How to use: Diluted three drops of tea tree oil in a teaspoon of carrier oil and apply directly to the cold sore with a clean cotton swab. Repeat 2-4 times per day but stop the treatment if the skin becomes irritated. Turmeric contains curcumin that has potent antibacterial and anti-inflammatory properties. In addition, turmeric essential oils contain antioxidants that can help speed up the healing process with cold sores and keep infections from recurring. According to research, curcumin may block the expression of HSV genes. How to use: For the remedy of cold sores mix 1 teaspoon of raw honey with 3 drops of turmeric oil. Apply a small amount of this mixture to the cold sore site, allowing it to soak in completely. Repeat as necessary once or twice a day until the cold sore is gone. Ginger oil contains gingerol that can help keep herpes simplex virus from spreading and reduce symptoms associated with cold sores. Ginger is known for its immune boosting, anti-inflammatory, antioxidant and analgesic properties that give it powerful therapeutic value. A study published in Phytomedicine in 2008 found that ginger oil inhibited HSV-2 activity in infected cells. How to use: It is best to start using ginger oil before the actual appearance of a blister. Mix 10 drops of ginger oil with one ounce of coconut oil and apply a small topically with a clean cotton swab to the area where you feel pain. It will feel warm on your skin and will help ease pain and inflammation immediately. Peppermint has a pleasing aroma and cooling properties that help provide relief from fever blisters. According to USDA Human Nutrition Research Center on Aging at Tufts University, peppermint oil has powerful antimicrobial and antiviral properties and is loaded with potent antioxidants. In a 2003 study, researchers found that peppermint essential oil demonstrated strong antiviral activity against both herpes simplex type 1 and 2. Three hours after application, antiviral activity was recorded to be as high as 99%. How to use: To make your own peppermint oil treatment, combine 2 drops of peppermint essential oil with one-ounce olive oil. Apply the mixture to a cotton swab and dab on the cold sore scab several times a day. Oregano is an herb in the mint family that has been used therapeutically for over 2500 years. It has a long history of use for treating colds, indigestion and stomach ailments. Oregano essential oil has antiviral and anti-inflammatory properties that make it effective for cold sores on lips. In one study published in the Journal of Agriculture and Food Chemistry, researchers found that the oils from Turkish oregano provided antimicrobial, antiviral and antioxidant properties. How to use: To use oregano oil for cold sores, dilute 3 drops of oil in one ounce of fractionated coconut oil. Apply to the cold sore at the scab state using a clean cotton pad. Repeat several times a day. How to use: Melissa oil is subtle enough to be applied directly to the skin. Simply apply a few drops of the oil to a clean cotton bud and dab on the blister three times daily until it is gone. Eucalyptus oil has anti-inflammatory properties that make it a good option for remedying cold sores. A research paper in the Journal of Ethnopharmacology found that eucalyptus oil can significantly decrease inflammation and speed up the healing process of cold sores. How to use: Dilute 4 drops of eucalyptus oil in one ounce of sweet almond oil and apply directly to the cold sore several times a day. Clove oil is extracted from the dried flower buds of clove and has a variety of medicinal properties and is often used topically for the relief of pain. In addition, clove oil is often used on a variety of skin conditions and to remedy asthma, headaches, stress, toothaches and blood impurities. Besides being an analgesic, clove oil has anesthetic, antiviral, antifungal, antimicrobial and aphrodisiac properties. The impact of clove oil on herpes virus has been researched and the antiviral and antimicrobial properties can help reduce inflammation, itching, pain and spread of the virus. How to use: Combine 2 drops of clove oil with 1 ounce of fractionated coconut oil and apply to your cold sore with a clean cotton bud several times a day. Chamomile oil is extracted from the flowers of the chamomile plant. It has powerful antiseptic, antibiotic and analgesic properties. According to research, chamomile oil seems to interrupt the absorption of the herpes virus into cells in a different way than antiviral drugs. These oils are known for their ability to reduce the symptoms of cold sores. You may be familiar with the ability of lavender oil to calm the body and the mind. This very same oil can calm inflammation on the skin which makes it the perfect candidate to reduce irritation and swelling caused by herpes simplex. In one double-blind study researchers applied lavender essential oil cream to 75 people with cold sores. The results demonstrated that the cream reduced the size of the blister and sped up healing. Participants also reported less pain after the use of the cream. How to use: To use lavender oil to ease the pain and inflammation associated with cold sores, mix 2 drops lavender essential oil with 4 drops of sweet almond oil. Apply liberally to blisters after they have formed a scab. Do not apply to open sores. If irritation develops or it is painful to put the oils on your skin, discontinue use. Some people may have an allergy to a particular oil, although it is uncommon. Do not use essential oils over a long period of time as they can weaken the epidermis of the skin. Read our Total Guide To Using Essential Oils Safely for more information on the safe use of EOs. Be sure that you purchase only high-quality essential oils from a reputable supplier. You can read our review of five of the most popular essential oil brands here, or if you don’t have time for that, then Plant Therapy are our number one choice and you can purchase all of their essential oils from here on Amazon. In addition to essential oils, the following home remedies can help lessen the redness, itching, inflammation, and pain for fever blisters. You may also be interested to read our article revealing the twelve best home remedies for cold sores ranked in order of effectiveness below.